In less than 24 hours, ODOT spokes-people maintained with equal assurance that the CRC was “no where on the horizon” and that the Department had clearly disclosed that the project’s traffic projections assumed the project had been built four years ago. In quick succession last week, ODOT denied the existence of any project plans, then said it would take two weeks to find them, and then produced 33 GB of plan files. Although the Rose Quarter project might allay the concerns of some bridge critics, there is no conjectural Interstate 5 Bridge project baked into the Rose Quarter plan, ODOT spokesman Don Hamilton said, because there is no interstate bridge project on the horizon. Pretty clear, huh? Rose Quarter is a separate project. No Columbia River Crossing here. The very next day, Tuesday, March 26, City Observatory (and Oregon Public Broadcasting) reported that materials found in the in obscure appendices and delayed public disclosures provided by the Oregon Department of Transportation showed that the traffic projections for the Rose Quarter Freeway widening project were built on the assumption that the Columbia River Crossing was completed–in 2015. ODOT acknowledged Tuesday that its traffic modeling for another freeway project — a $500 million upgrade to I-5 in Portland’s Rose Quarter area — assumes that the Columbia River Crossing will still be built. Channell disclosed the CRC traffic assumptions after opponents of the Rose Quarter project found hints of it in technical reports that ODOT released under pressure. As we related at City Observatory on Tuesday, the “notice” of the CRC was, in reality, deeply buried in an obscure appendix to the project’s environmental assessment. One had to navigate a vague cross-reference, dig into a minor footnote, follow a web-link to a non-ODOT website (not part of the EA) and wade through hundreds of lines of fine print in a large Excel spreadsheet to find any reference to the CRC. As regular City Observatory reader Spencer Boomhower observed, Channell’s attitude bore a striking resemblance to Arthur Dent’s experience in in finding the public notice of the forthcoming demolition of his home–for a highway, naturally–in the opening scenes of Douglas Adam’s “Hitchhikers Guide to the Galaxy? Mr Prosser: But look, you found the notice, didn’t you? The half life-of any particular truth at the Oregon Department of Transportation is apparently measured in periods of less than 24 hours. That’s all it took for the official position to flip flop 180 degrees. We have, indeed, always been at war with East Asia. Plans? We don’t have any plans? . . . Oh, you mean those plans? The 33 GB of plans. Surely, even that whopper about the Columbia River Crossing is an anomaly, isn’t it? Actually, no. Lying about basics of the project seems to be pretty much accepted practice at the Oregon Department of Transportation. Let’s go back a week or so further, a bit earlier in the comment process on the Rose Quarter Environmental Assessment. Iain Mackenzie, editor of the blog Next Portland, which chronicles in detail all of the real estate development projects in Portland (trust us: this is an invaluable resource), looked at the public materials disclosed by ODOT, and saw some interesting computer generated renderings of selected views of the project. An expert in this field, Mackenzie immediately contacted ODOT, to ask for copies of the plans which were used to produce those renderings. Mackenzie, based on his technical knowledge of computer rendering, knew that such renderings could not be created without such plans. He pressed his request, and ODOT acceded that such plans, in fact existed. On February 25, 2019, Mackenzie filed a public record request for these files. On March 20, 2019, ODOT finally replied to his public records request, stating that it would take twenty-five business days and $6,000 to supply such records, meaning such data would be unavailable until after the expiration of the EA public comment period. Mackenzie’s attorney then met with ODOT, and following that meeting on March 26, 2019, ODOT released 34 gigabytes of computer data files containing plans of the project. It has only been for the following 5 days prior to the project’s April 1 comment deadline that he and other members of the public have had the opportunity to review this highly technical information. With just a handful of days to study this giant pile of data, project critics quickly identified issues ODOT had hidden. Mackenzie pointed out the plans show that the freeway will be widened over the top of the Vera Katz Eastbank trail. 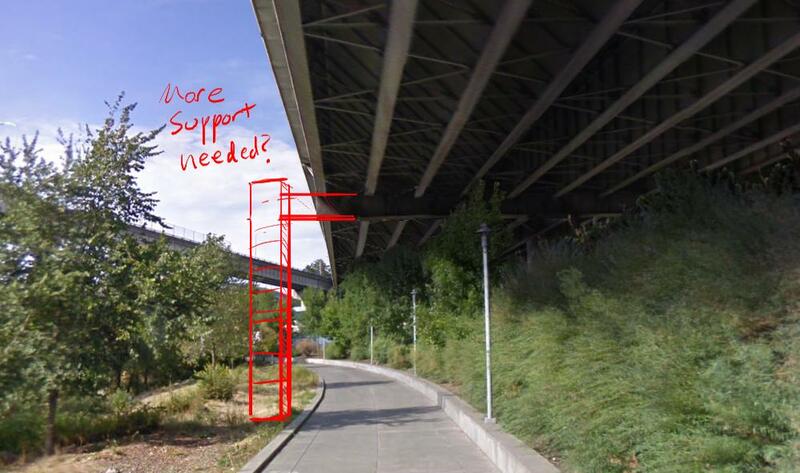 The freeway itself would be widened over the trail (below), and what the renderings don’t show, is that additional physical support would be needed to support a much wider viaduct, which would likely be a further intrusion into the trail (as shown by the annotation added by Cupola Media). Source: Cupola Media, via Iain Mackenzie, from withheld ODOT plans/renderings. Doug Klotz showed that the ODOT plans add an additional travel lane for cars on Weidler Street, and clearly how ODOT will cut-away the corners of several blocks in the Rose Quarter, speeding traffic and endangering pedestrians. These features were invisible or de-emphasized in ODOT’s selective renderings of the project. 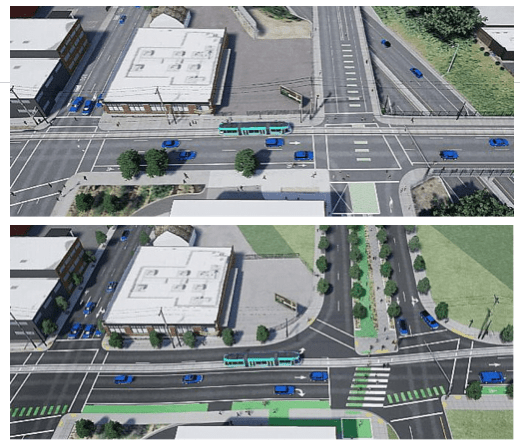 The top rendering shows the existing Weidler street running left to right, with three travel lanes, and “square’ corners with short crosswalks; the bottom rendering shows the freeway widening project, with four travel lanes, corners cut away and much longer, more vulnerable crosswalks. Source: Doug Klotz from withheld ODOT plans/renderings. Withholding these files from public release prevented technical experts like Mackenzie and Klotz from identifying problems like these (and there are undoubtedly more). They also prevented the general public from learning the true nature of the I-5 Rose Quarter freeway widening project before the comment period expired. This clearly frustrates the public’s right to know about the project’s likely impacts, which is the centerpiece of NEPA. We’ve taken a tongue in cheek attitude toward the serial prevarication of Oregon Department of Transportation, but make no mistake, this is an issue of the utmost gravity. Our citizens and our democracy rely on the honesty of public servants doing their jobs and, at a bare minimum, telling the truth. The hallmark of the National Environmental Policy Act is information and disclosure: its purpose is to reveal to citizens the likely environmental consequences of government actions. When government officials intentionally lie, deceive, and deny the existence of key facts, they undercut the foundation of our democracy. In the case of both of these lies and deceptions, they’ve both come in the last few days of the very limited comment period set by ODOT. In both cases, the only reason the truth was revealed was because citizen advocates, at their own time and expense, forced the issue. Extracting facts and honesty from public servants shouldn’t be contingent on this kind of heroic effort. Public servants at the Oregon Department of Transportation have an affirmative obligation to tell the truth and reveal the facts. They are doing so only belatedly and grudgingly, if at all, with the evident intent to deny the public the right to know and participate. And in the process they’re damaging our state. We deserve better.